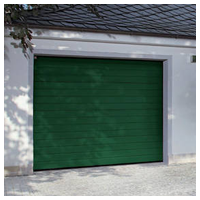 A garage door is an undervalued feature of a home, often only replaced when an existing stock door that came with the house is broken into or damaged beyond repair. 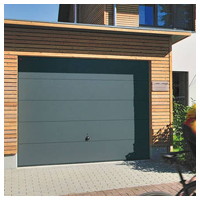 A modern garage door with the security and technical features of modern day can increase the protection, aesthetic and more importantly, the price of your home. With longevity garuntee's, the right choice and styles can suit your needs with the most popular models being listed below. 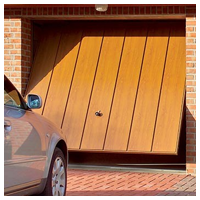 An Up & Over Door is the most common and often least expensive garage door. 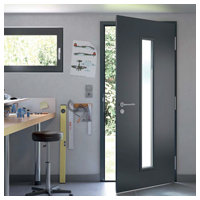 Each door consists of a solid panel constructed from tumber, steel or GRP (Glass Reinforced Polyester). With two opening mechanisms, canopy and retractable gear. 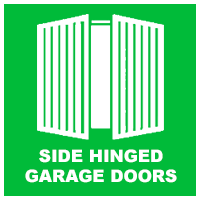 The most simple concept of an Up & Over, being the most common type of garage door, it is attached only to the guide rails on either side of the door frame. 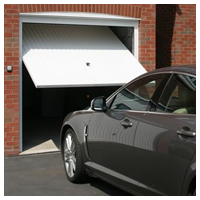 When lifted, the door is raised up and protrudes out, much like a canopy, this can make wider garage doors useable for those with larger cars due to the lack of a wider frame system, however the Canopy gear would require a bow arm conversion kit to become automatically openable. This method fully retracts the door panel inside, making the opening to the garage have no protrusions from the door itself. It contains a framework system which is attached to the door frame and a track for the door rollers to guide the door back. 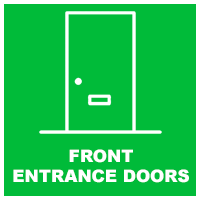 This is the better option for having an automatic electric door mechanism. 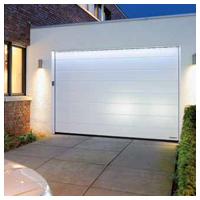 With a retractable gear, it can lift heavier loads for larger garage door sizes to be used, without the use of cables. These doors typically last many more years maintenance free than the alternatives. 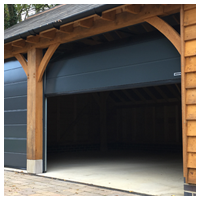 A Sectional Garage Door is becoming an increasingly more popular choice in the UK for a garage door that has fantastic utility and visually different to anything in their neighbourhood. With multiple hinged sections, when opening the door panels follow along a rail to change its shape and open fully. 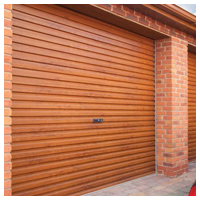 With a finely selected range of low cost roller shutter garage doors that meet the strictest security and safety requirements, a roller shutter is on the the simplest and easiest garage doors to operate. 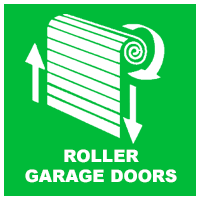 When open, roller sutters act as a curtain to roll up and above the garage door opening for both extra space on the driveway and inside the garage itself. 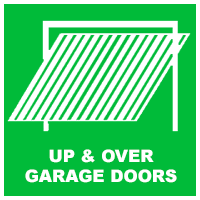 An Up & Over needs to rest the whole door on a rail within the garage, a roller shutter fits into a compact box above the door. With non-insulated or full insulation qualities, meaning you can keep the garage warm if you use it often. With a broad range of colours and choice where the box should be situated. 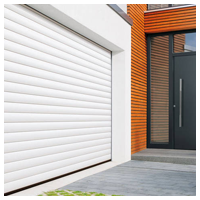 Roller Shutters are available with both manual or electric operation. 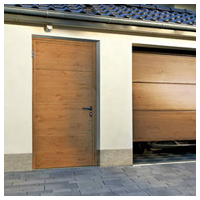 Side-Hinged Doors are a solution for those who have restriction issues with other garage door types. Providing space inside the garage and bypass obstacles such as ceiling beams in the garage. 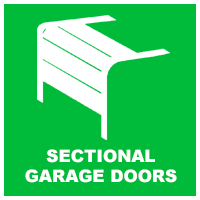 Being able to open inwards or outwards, perfect for those who use the garage on foot or not used to house a vehicle often. Or for converted spaces into a room such as a workshop, office or gym. With Side-Hinged Doors, only one side of the door needs to be open, leaving it to be used as a doorway, making it easy to store items in such as bicycles and garden utilities. The doors can also be made into 1/3rd and 2/3rd split. 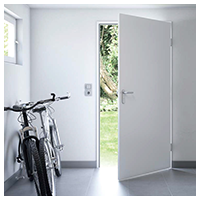 Available as single or double skinned panels in many steel and timber options if a wooden door is desired. Timbers include Oak, Ceder, Idigbo and Accoya. 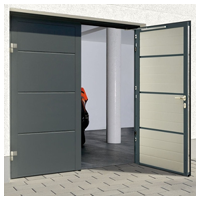 All Side-Hinged Doors are available manually or electrically operated for various methods depending on size and weight of the door. 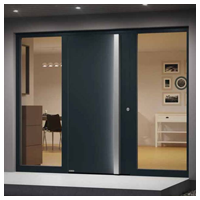 With a new range of insulated double skinned steel Side-Hinged Doors, all are made to order and include pre ditted aluminium fixing sub frames. 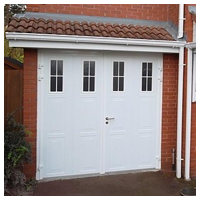 These doors have double rebated edges with built in rubber seals and offer the highest levels of weather protection for your garage. 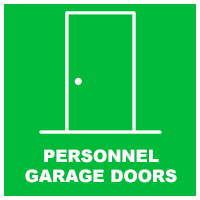 Personnel / Pedestrain doors are offered in a range of steel and timber for use on either a garage or any other part the outside to a building. 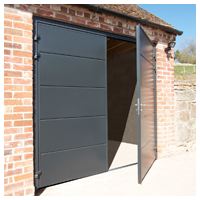 All steel doors have a prefitted steel or aluminium fixing sub frame ready for easy on-site installation. 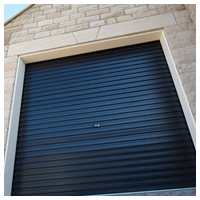 Steel Doors are in either single skin or double skin construction, offering excellent levels of insulation and security against forced entry. The traditional timber pedestrian door we offer are manufactured using traditional methods and the highest quality timber, including Cedawood, Idigbo or Accoya. The sub frames are optional, available in different sizes with factory assembly when ordered so the door is delivered with all the hinges and finishing taken care of. 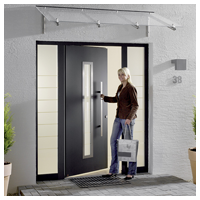 The doors are available in some standard sizes but most are available as purposely made doors for a perfect fit, optimising the passage width and height of a door opening. 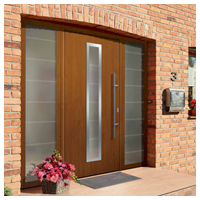 Click here to find out more about glazing options.